Formerly known as I Am Eco Plumbing, Laser Plumbing Newcastle Central is a local, ethical and family-run business, serving Newcastle, the Hunter Region, Central Coast and Port Stephens. Hi, I'm Ian, the Company Director. Over my 24 years in the plumbing industry, I've developed a real passion to provide a professional, hygienic & reliable plumbing service in my home town. Safety is our priority for both you the client & my team. I'm lucky enough to work with a fantastic and professional team who are equally eco-minded. Between us, we have over 100 years of experience in plumbing, drainage and gas fitting for homes and businesses. We pride ourselves on our professional, efficient and reliable service and we're always respectful of the residential, commercial and government properties we work with. What's more, we believe in taking a collaborative approach. So, if you have a project in mind, the first thing we'd want to do is visit your property for a consultation." 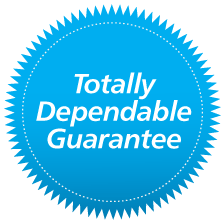 Every Laser Plumbing Newcastle Central member company provides you with 'Totally Dependable' service, guaranteed!